The Airbus A350 XWB Ultra Long Range version has completed its first flight. The aircraft powered by Rolls-Royce Trent XWB engines successfully completed its first short flight test programme to certify the changes over the standard A350-900 that will extend its range capability to 9,700 nautical miles. The test phase also measure enhanced performance from aerodynamic improvements, including extended winglets. The changes include a modified fuel system that increases fuel carrying capacity by 24,000 litres, without the need for additional fuel tanks. With a maximum take-off weight (MTOW) of 280 tonnes, the Ultra Long Range A350 XWB is capable of flying over 20 hours non-stop. The A350 XWB features the latest aerodynamic design; that includes a carbon fibre fuselage and wings, plus new fuel-efficient Rolls-Royce engines. Together, these latest technologies translate into unrivalled levels of operational efficiency, with a 25 per cent reduction in fuel burn and emissions, and significantly lower maintenance costs, along with a quiet twin-aisle cabin and new air systems. At the end of March 2018, Airbus has recorded a total of 854 firm commercial orders for the A350 XWB from 45 customers worldwide, already making it one of the most successful widebody aircraft ever. 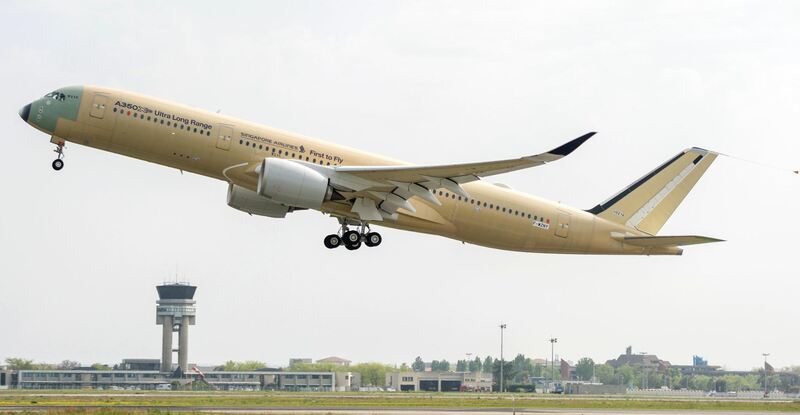 Of these customers Singapore Airlines has placed one of the largest orders for the A350 XWB Family, having ordered a total of 67 A350-900s, including the seven Ultra Long Range models with 21 A350-900s already delivered to the carrier. The A350 XWB is an all new family of widebody long-haul airliners to which VVIP completion customers can benefit. Competing with the Boeing 777X, this size of aircraft provides Heads-of-State, private and corporate customers unrivalled space and cabin comfort, with improved range and fuel economy over previous wide-body aircraft including the traditional four engined options of the Airbus A340 and the world famous Boeing 747. The corporate variant of the commercial A350 XWB is names the ACJ350 XWB and is available to order from Airbus.